Despite Johann Sebastian Bach never having been to France in his lifetime, and despite him having no personal contact with French composers, he knew French music of the time very well. He had heard works by French masters, and also used pieces by composers such as Nicolas de Grigny, François Couperin or Charles Dieupart in his own music. 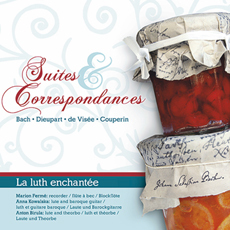 Thanks to the research and arrangements made by “La Luth enchantée”, the ensemble is able to give the audience a very personal approach. By concentrating on the theme “Bach and France”, the musicians open surprising analogies, thereby having adapted the programme to their instruments: lute, recorder, theorbo and baroque guitar. The parallels in the pieces result either from the fact that the composers copied each other, such as Bach and Couperin or Bach and Dieupart, or from the fact that the French composers knew one another, such as Couperin and De Visée or De Visée and Du Fault.